Gelatinous orange tentacles hanging on Eastern red cedar (Juniperus virginiana) trees are the product of a fungal infection. The disease begins as dark spots on the leaves that develop short, hanging orange growths as it progresses. These tentacles contain the spores of a gymnosporangium rust ready to spread to another host. Eastern red cedar is a cold-hardy tree that grows in U.S. Department of Agriculture plant hardiness zones 2 through 9. Needles and branches of a red cedar tree. Cedar-apple rust and hawthorn rust are the main causes of orange tentacles on Eastern red cedar. A cedar-apple rust infection typically begins the fall in the form of green or brown galls that can reach 2 inches in diameter on the tree's twigs and small branches. The trademark orange tentacles this disease produces develop in spring and eventually release their spores into the surrounding area. These tentacles are typically less than 1 inch long and develop during wet weather. Dry weather causes the tentacles and the galls they sprout from to shrivel. Gymnosporangium rusts cause little or no damage to Eastern red cedar, but a heavy infection of gooey orange tentacles can make the tree unattractive. These infections are relatively short-lived once the orange tentacles begin to appear. The galls and orange tentacles may take up to two years to form after a cedar tree is infected. These infections sometimes appear briefly in spring and disappear, only to come back the following year when the tree is reinfected by spores from a tree infected by the initial dispersal of spores. You can prevent gymnosporangium rust from developing orange tentacles and infecting other susceptible plants in your yard by removing the galls it creates during the first stage of its growth on a cedar tree. Pruning the stems supporting greenish-brown lumps in the outer branches of a cedar tree prevents the disease from progressing. The best place to make pruning cuts is where the base of the stem meets the branch supporting it. Dip the blade of your pruning shears or saw in rubbing alcohol in between cuts to avoid spreading the disease to other parts of the tree. Fungicides generally won't work for this type of disease. The orange tentacles this disease builds on cedar trees is only one stage of this disease. Once the spores are released from the tentacles, they infect nearby plants in the Rosaceae family. Brightly colored spots appearing on the leaves or fruit of a nearby tree are a common sign of a gymnosporangium infection that has spread from a cedar. 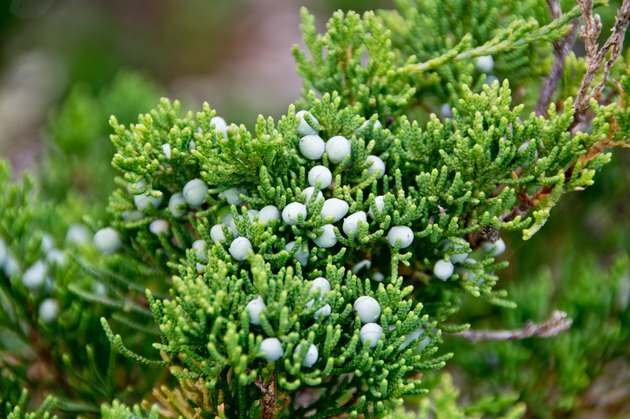 The life cycle of this disease requires a cedar tree or another member of the Juniperus family and one plant from the Rosaceae family to complete its life cycle. Separating these plants or removing one of the susceptible plants will prevent the disease from recurring in the future but in open, windy areas airborne spores can carry the disease from host plants up to a mile away, depending on prevailing wind direction. What Causes Black Spots on the Apples of My Trees?